A popular Melbourne band who operated between 1971-73. 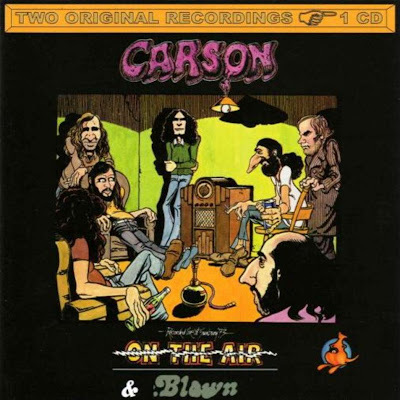 They were earlier known as Carson County Band. Their work was wide-ranging, but can best be described as boogie rock. The Travelling South 45 saw the band extend out beyond their earlier strict blues format on the 'A' side. which was notable for a dual guitar lead riff that leads into a passage of superb slide guitar playing. The flip side was a strong blues song with lots of riffs and superb slide guitar. Their debut album Blown was a solid effort full of wild bluesy hard rock. It's notable for Sleepy Greg Lawrie's slick slide guitar work and sported a cover with striking (but simple) sci-fi imagery. It contained a version of Boogie, which differed considerably from the single. The material ranged from powerful numbers like this to laid back blues evidenced in Up In Queensland and Sunday In The City with a rock 'n' jazz offering in Rock And Roll Game and an instrumental Banana Power providing further diversity. By 1973 they'd lost their sense of direction as evidenced on On The Air. If you're into blues though, there's still a lot of relaxed playing to be heard on here. There are some good guitar licks on Elmore James' Dust My Broom and another version of Boogie, whilst Dingo and Laid-back Feel were good mood pieces. The album is a document of their performance at the 1973 Sunbury Rock Festival. It was no real surprise when they went their separate ways after Sunbury 1973. Broderick Smith went on to The Dingoes.